I got to know about blogging and made my very own blog on blogger and now I'm applying for Google Adsense but they are rejecting my blog for putting ads on it. I am damn sure all of you have got same question! The best part is once I also had to ask this question to a lot of people and fortunately I got the answer. So just relax back and follow my simple steps on how to make your blog qualify for Adsense. How to qualify for Adsense? 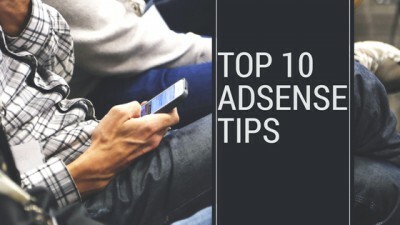 Before applying for Google adsense, here are ten necessary tips for adsense approval for your blog. But before anything else if you are new to blogging or started a new then my advice for you is that first increase traffic to your blog, keep learning and grow your blog for atleast one year. Give more value to readership than generating revenue through your blog. In this way you will succeed in your blogging career! You are applying for Google Adsense but your blog doesn't have enough content in it for the Google crawlers to review. Crawlers are Google Robots that go through your blog and figure out the type of content and place the necessary ads according to your type of content. If you have created a blog but you are not posting anything in it then I'm afraid Google is not going to bother your blog! So unique quality posts rich content is necessary to make your blog qualify for adsense. Well, Google has no such rule for having a specific number of posts on your blog so post as much as posts as you can of atleast 600+ words daily and most importantly, only post informative good quality content and not gamling, adult related and illegal content because Google has its policy for not placing ads on certain type of content. See here Prohibited content. One of the biggest mistake that beginners make is applying for Google Adsense just after one day or more of creating a blog on blogger. If you think that you will get your blog approved for adsense after few days then it's completely wrong. Your blog needs to be crawled by Google crawlers to be reviewed and it takes time. Google policy says that your blog needs to be six months old so this is confirm that before six months you are not going to get your blog approved. So I personally recommend that first grow your blog, make good quality content and socialize your blog for at least six months to get more traffic for your blog and then apply for adsense. This is also a biggest blunder that any blogger ever could make. I won't call it a mistake because I don't think any one can do it by mistake. This is the first thing I learnt before making my blog that don't upload any copyrighted material in your blog because copyrighted material is someone's property and copying it from someone's blog and posting on yours is stealing and can be punished by law. So avoid adding copyright material to your blog. If you see someone is using your material you can file a complaint here by Google law DMCA counter notification form. If your blog don't have enough traffic coming then adsense will not approve your blog because do you think advertisers will be interested in placing their ads on the blog that has no traffic. They will definitely place their ads on the blog having great traffic so increase your blog traffic first then it will qualify for adsense. Socialize your blog, share every post on every social media platform that you personally use. In this way, your blog will grow and more unique visitors you will get for your blog. This is also something you need to consider before applying for adsense. Navigation is the menu bar of any blog or a website and it is the first thing a visitor looks at at least in my case. So having a good navigation bar in your blog is a key to ensure great user-experience and more people would like to visit your blog again. So make it easy to use and easy to read bar. Don't forget to make About Us and Privacy pages for your blog and make them easy to find because About us page will describe your blog and privacy page will ensure users that there information is completely safe with you. Make sure that you have the access for your site or blog. You are the owner of the site. So you must have access of the HTML code of your blog because if you somehow get the blog approved but then you won't be able to put ads on bog because you don't have access to the HTML code of the blog. Google reserves the complete right for approving or disapproving your blog for anytime. They have some restricted policy i.e you won't engage in ads click encouraging scheme etc that you must have to follow before applying because if you don't they can easily ban your website or blog for not complying with their policy. So you can check out the Google Policy here Adsense Program Policy. You can't get your blog approved before six months. This is not true always but I personally recommend you that if you made a blog then completely forget about the Adsense approval for atleast six months and just keep posting good quality unique content for your blog. Post as much as you can for six months because more content rich blog will be, the more chances to make your blog qualify for adsense will be. Work on SEO (Search Engine Optimization) of your blog to get better position in search engines. Blog template is also an important thing for attracting users. Template of your blog should be user-friendly and responsive because different people use different size of devices. Responsive template means that template will adjust widgets and gadgets of the blog according to the size of the device. The more easy to use and navigate template will be, the more attractive your blog will look and in this way you can impress the Google system for approving your blog for adsense. There is no such rule that you can't approve your blog if you have .blogspot domain but if you are willing to become a pro-blogger then it's a good practice that you buy a custom domain. Make sure that you use keyword for your blog that is related to your blog niche and you will attract more traffic. Custom domain is something like .com, .net or .co. So if you don't want the word .blogspot in your domain then you can buy a custom domain. Never buy a domain from blogger because there are a lot of platforms from where you can buy cheap domains for your blog. You can buy your custom domain from Godaddy. If you have followed every single tip I mentioned above then I am damn sure your blog will get approval to qualify for Google Adsense. Put ads on your blog and enjoy! Don't forget to give opinions in the comment section below! Very informative article, great for us newbies. Keep up the good work.